Dr. Peter J. Fell is the director of the Oxford Allergy Centre in Oxfordshire, U.K. and also runs the Deddington Allergy Center in Oxfordshire; This Paper was presented at the Annual Meeting of the American Otolaryngic Allergy Association, September 27, 1991; Kansas City, MO by Dr. Fell. The Alcat Test has been shown to detect and predict those foods most likely to cause a problem in irritable bowel syndrome and subsequent food challenges after a period of elimination were statistically significant. (1) Other conditions were reported as being a consequence of food sensitivity correctly predicted by the Alcat Test (2) plus a number of case studies supporting the useful role of this test are reported. (3) The purpose of this pilot study was to investigate whether the Alcat Test could also detect changes when whole blood was incubated with naturally occurring pharmacoactive agents. This would provide important information as to the mechanisms of action in this test because these agents would not produce an immunological/allergic change. It would support hypothesis that the Alcat Test detects a final common pathway which in this instance would be the result of a pharmacological action, causing a change in size of the white cells. Migraine patients were chosen in addition to normal health volunteers as a group most likely to react to vasoactive compounds and if the test were positive it would provide a useful model for this condition. The pilot study was designed as three different experiments. The first was to determine the concentration of pharmacoactive substance which would be used consequently in patients and human volunteers. The second experiment was to check the reproducibility of the test by running duplicate samples. The last experiment was to study the effect of pharmacoactive agents in the Alcat Test using blood taken from healthy volunteers and patients suffering from migraine. 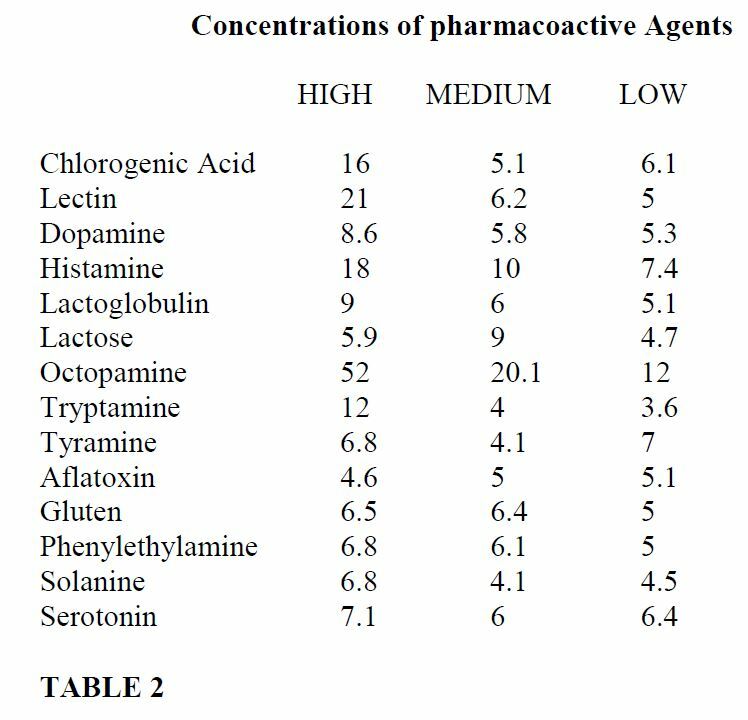 Reference to table 1 shows the pharmacoactive substances to be studied and where they are commonly found in various foods. In the first experiment 3 different concentrations of pharmacoactive (table 2) substances were incubated with whole blood for 2 hours and the Alcat Test then performed in exactly the same was as has previously been published (1). A high concentration was determined a 5 microgrammes per 40 microlitres, a medium of 1 microgramme per 40 micro litres, and the lowest at 200 nanogrammes per 40 micro litres. This when diluted with 500 microlitres, of whole blood plus buffer would give concentrations in the range that might be expected naturally. 4 healthy volunteers had a blood sample taken and split into 3 aliquots and then incubated with the 3 different concentrations of the 14 pharmacoactive substances. The second experiment was carried out as a result of the first and in 3 volunteers the lowest concentration was used. In this experiment the blood sample was split and duplicate Alcat Test runs made at the lowest concentration with the same 14 pharmacoactive substances. The final experiment was conductedin 10 healthy volunteers whose results would be compared with 10 patients who had a long history of migraine. These patients had all previously had an Alcat Test to foods which had shown them to be sensitive. They had all improved with an elimination diet but were still having occasional severe migraine attacks. Blood was taken from the volunteers and patients over a 2 week period and an Alcat Test run at the lowest concentration of the 14 pharmacoactive substances. The final experiment was conducted in 10 healthy volunteers whose results would be compared with 10 patients who had a long history of migraine. These patients had all previously had an Alcat Test to foods which had shown them to be sensitive. They had all improved with an elimination diet but were still having occasional severe migraine attacks. Blood was taken from the volunteers and patients over a 2 week period and an Alcat Test run at the lowest concentration of the 14 pharmacoactive substances. concentration of pas in 3 healthy volunteers. and 10 patients suffering from migraine. Reference to table 3 shows the mean of the percentage shifts from their own control sample in the 4 healthy volunteers using 3 different concentrations ( high, medium and low ). It is of interest to note that although the majority of results in the medium are within the expected range of normality for the Alcat Test e.g. 9%+or-3% octopamine still remained outside the range. The lowest concentration however showed all the results to be of the same order as those previously reported for food in health volunteers. (4) In the 3 health volunteers using the low concentration of the 14 pharmacoactive substances the maximum difference in the duplicates was 4% which again correlates with the previous experience using this test with food substances. It was therefore considered that normal subjects using the low concentration of pharmacoacitve substance would be of the same order as food e.g., 9% + or – 3%. The results of studying 10 normal volunteers and 10 patients suffering from migraine ( table 4 ) and surprisingly a number of the normal volunteers showed quite brisk reaction to one or two of the pharmacoactive substances and both groups showed a major reaction to histamine. There were however statistically more (at the 2% level ) reactions in the migraine patients than the healthy volunteers. 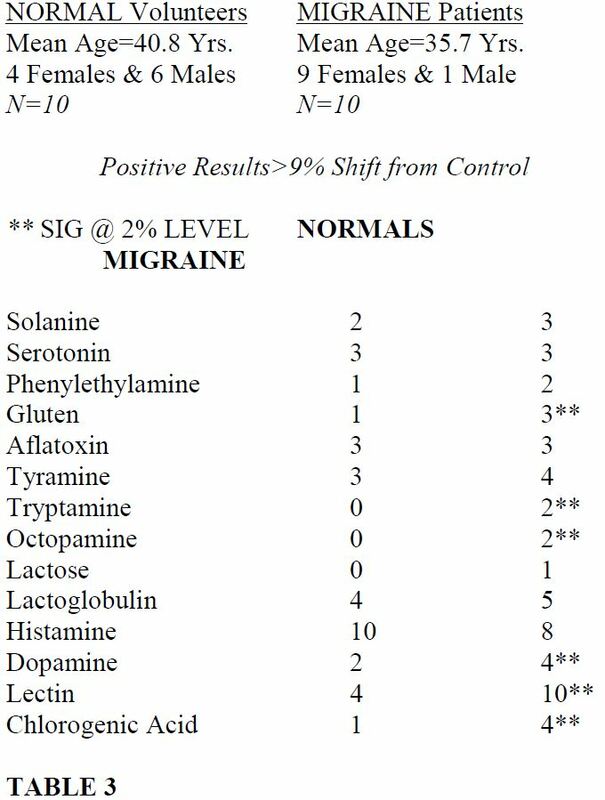 Furthermore a number of substances were significantly reactive in the migraine patients (gluten, tryptamine, octopamine, dopamine, lectin and chlorogenic acid ) also significant at the 2% level. It is also interesting as an aside to note that this dose of histamine given as a skin prick test produced a positive result- a 4 millimetre wheal. These results are extremely interesting in that it is highly unlikely that there is any immune mechanism playing a part in these results and the pharmacological reaction of these substances is well known and published with the exception of gluten and perhaps lectin. Thus it does appear that the white cell can act as a model of activity by either a toxic or pharmacological effect. This effect produces a change in size of parts of the white cell population which the Alcat Test can detect. The purpose of these series of experiments was to show an effect in migraine patients of substances which might be considered as triggers for a migraine attack ( 5,6,7 ) thus the next step would be to correlate the Alcat Test results with a pharmacological challenge using these substances. Furthermore, now that it has been shown that the Alcat Test is reproducible using simpler molecules than food it is possible to use the white cell changes with a whole range of other chemicals such as food additives and environmentally common substances where it would be unlikely that there was any immunological effect on the body but where environmental factors may be triggering illness. Further work is thus warranted to expand the usefulness of this test. 3. D. Sandberg M. Pasula. A Comparison of the Alcat Test for food Reactions Amongst Two Population Sub-groups. Presented at the 45th Annual Congress of the American College of Allergy & Immunology, November 12-16, 1988- Los Angeles. In Publication- Annals of Allergy.